Happy Saturday, everyone! 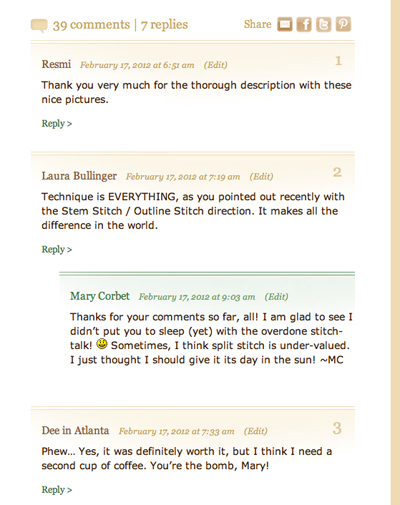 I’m very excited this morning, because some new features and fixes have gone into place here on Needle ‘n Thread. I can’t wait to show them to you! And trust me, these fixes aren’t due to any technical genius on my part. When I need something to happen that I can’t manage on the technical side of the website, I turn to Dan Holmgren and his crew at Imagemakers in Wamego, Kansas, because that’s what they do – they make websites work right, and they make them work beautifully. The biggest change you’ll notice is in the comment section down below each post. This is so much fun – I hope you like it as much as I do! There’s a reply feature in the comments section now, so that you and I can reply directly to any particular comment. The replies are “nested” underneath the comment receiving the reply. This makes for much better interaction on the website, and it keeps conversation strings much clearer. The previous situation with comment numbering was quite confusing, so that’s been taken care of! Up to 200 comments will show on each page, and you can easily navigate through the rest of the comments on each article by using the links at the very end of the page, to move to other pages of comments on the same article. The best place to see this feature in action is at the end of the most recent give-away here on Needle ‘n Thread, for the RSN Handbook of Embroidery. If you scroll all the way to the end of that page, you can see the links to take you to further comments on the post. Previously, only 99 comments fit per page, and when you scrolled through the pages, each page started numbering all over again. That is now fixed, and my website life will be so much easier because of it! Other updated features include the main navigation bar at the top of the website. You’ll notice a new link called “Shop“! Now, please don’t misunderstand this! I am not retailing needlework supplies. This is just a link to the area where you can purchase your spot in my online classes when they are available, or purchase my e-books. Considering there’s only one ebook available, things are pretty sparse in there right now, but I thought a shop area was necessary to keep things clearly categorized on the website. The main navigation was getting a bit crowded, so you’ll notice that the “Pictures” link is no longer there. You can find the “Pictures of Hand Embroidery” button available in the right hand column. At the top of the left column, you’ll see some social networking links available. Those have been there all along, but now there’s a new addition! The button on the right in that line of icons is a Pinterest button, so if you want to add anything from Needle ‘n Thread to Pinterest, you can do it easily using that button. You can also follow me on Pinterest through the same button. Granted, I haven’t done much on Pinterest yet, but it’s a fun site and a great way to collect online images for inspiration. I plan to make more use of it in days to come. I’ll be spending some time over the next couple weeks doing some indexing of articles on the website, too – just catching up on categorizing some of the content, so that it’s easier for you to find it. There are a few less visible tweaks on the site, too, and hopefully they will all make your experience on Needle ‘n Thread a more pleasurable one. Hope you enjoy the new updates and that you find them an improvement! Any questions or comments or suggestions, feel free to have your say below. I am computer challenged, and your site is the one I prefer because it has been so easy to use from the very beginning. Not to mention all the wonderful teaching you do every day. They are real eye openers for the novice embroiderer to be. Thanks, Velia! I try to keep it easy to navigate. I’m always having to sift through stuff to find it, so I figure if I have to sift much, then it must be worse for readers!! Hence, I’m always looking for ways to clean things up! I thought you were updating your website when I was looking this morning I couldn’t get into some of the categories. I’ve just looked at pinterest its looks so interesting all the different sites you can look at I will definately be exploring that in more detail, I’ve not heard of pinterest before. Love the idea of the shop and the reply at the end of the comment is a good idea. So interesting your site. Pinterest is fairly new, Anita, so it’s really just getting off the ground. I like it because it’s a good way to organize inspirational stuff I come across online, and to keep track of my own things that I want to go back to and think about in more detail later on. I haven’t done a whole lot on it yet, but I hope to get used to using it more frequently! Love the new changes/improvements to your website. AND I LOVE Pinterest. I pinned quite a few items from Needle ‘n Thread a few weeks ago. So fun- all of it. I’m enjoying Pinterest, too. It’s fun! It’s kind of like spring cleaning and reorganizing! Congrats on all the “new and better”! Pinterest is addicting btw, be careful! I’ve seen some of your stitching on there before. Yes, that’s exactly what it is, Gail! Spring cleaning! I’ve noticed it’s hard to get off Pinterest when I’m on there. I like to search “embroidery” every now and then – some really fun stuff to browse through! Good job on the updates! This site is full of valuable (and fun) information, and keeping it all organized and easily accessible is a HUGE job. You and your helpers have accomplished what many sites strive for — it’s always a pleasure wandering around in Needle ‘n Thread, and I always find helpful answers to my questions. Thanks, Cindy! I’m glad you enjoy Needle ‘n Thread! There are, at present, 1,773 articles on the website… I’m not sure they’re all quite organized yet, but… I’m working on it!! Recently discovered Pinterest. It is very addicting. Needle n’ Thread was my first pin. Look forward to following you there as well as here. Thanks, Carolyn! I’m having fun testing the new comment section! Thanks for the pins on Pinterest, too! I appreciate that! Indexing!! Continue what was already excellent indexing! It is so helpful! Hi, Molly! I shall! Still a lot of work to do, but I’m getting there! Glad you like it! You have a very nice blog and these additions can only make it better. Congratulations on your new website. I was chuckling when you said you would be spending time working on the website. I guess you’ll be wishing you could stop time so that you can do all the things you want to!! If I’m on my computer, I’m not sewing, if sewing I’m not embroidering, and if I’m doing those things, who the heck is doing the housework!!!!!!!!! I so wish I could stop time, but it seems to go much faster these days!!! Good luck though with the new site. It’ll be interesting seeing the items that are put on. Mary, you amaze me with your website. Now, I can find more goodie information and will be more “funner”!!!!!! It just keeps getting better and better, Mary! Ordinarily, I groan when a blogger makes changes to his/her site, but these look great! As others have said, Needle n Thread just gets better. Whew… That’s one thing I want to avoid, too, Kathy – the kind of changes that are disorienting. There’s nothing worse than just beginning to feel “at home” on a website, and then get discombobulated with major changes. I’m hoping these changes are subtle enough that they won’t throw anyone off balance! Love the editions to the website. It’s a while since I have had a look as I receive your emails everyday. Now I realise that I shall have to have a look more regularly and now you’ve introduced me to Pinterest. Oh dear. There is no time to sleep or eat. I have to work and stitch of course. Congratulations Great stuff! All good, spot on, you beaut, way to go and all that! Thanks, Kath! You always make me chuckle! Thanks for that! Communication/talking together often answers questions haven’t even thought about. I am like Phillipa (not another site) but when ready will go to your pinterest first. It is great that you can now reply to the person rather than down the queue. I am really feeling this is world stitchery. Thank you Mary for creating this wonderful world to share. Hi, Susan! Yes, I’m very excited about the new comments features and the ability to reply directly to individual questions! I think it will help everyone in the long run! Everyday I open my mail with very eagerness to see the mail from Needle and Thread. I am very very much interested in embroidery. I get to know so may stiches, colour combinations. Over all So many designs from all over the world. Hi, Veena! Thanks so much for your comment and your enthusiasm! I’m glad you enjoy the website! Hi Mary, What is Pinterest? Hi, Kathy – well, Pinterest is kind of a visual social network. You “pin” pictures in different organized boards (kind of like bulletin boards). It can be really helpful if you collect a lot of pictures online for inspirational purposes. So, for example, if I see a photo online that grabs my attention – say, someone’s embroidery project – and I know I would want to go back to it some day to look at it again, I can “pin” the picture to my “Embroidery” board on Pinterest and go back to it later. It stores the link as well, so I can revisit the page it came from. I can also search Pinterest for pictures of embroidery or design or art, etc., and see what other folks have found that they find inspiring. So it can be helpful, inspiring, and fun. But, like all social networking, it does end up eating away time, so I use it pretty sparingly right now! Still, I like it. It’s fun! I love…. the new look and the reply feature:).Many times when I read your post I wanted to ask you something,I used to read all the comments to see whether someone had already asked that and to find out your reply was a big thing….when there are so many comments.Now you’ve made it easier for me and thank you so much for that. My experience on Needle ‘n Thread is more pleasurable than not. I enjoyed it as it was and for sure we will enjoy the “new” site. Oooh, Mary, I love this new answer facility you have. I think the only problem with it is that you’ll be so busy answering everyone it will really cut down on your stitching time!! Happy Family Day from Canada. Thanks, Lisa – I like it, too! Well, I’ll probably only use it to answer direct questions. I am pretty certain I won’t be answering every comment left on the site 🙂 You’re right, it would REALLY cut down stitching time! Thanks for the good wishes! Happy Family Day to you, too! Hope you do something fun for the holiday! These are great updates indeed! Mary, thanks for the explanation of the new features. But please tell me, how on earth do you find the time to do the fabulous embroidery you do, write the daily updates for this site, do the normal daily things and find time to reply to each comment! Superwoman or what? And into the bargain you teach and do other things I think ….. oh my brain hurts. Next Next post: RSN Handbook of Embroidery – Winner Announced!